The bacterium Clostridium tetani is the causative agent of tetanus, commonly known as lockjaw. The bacteria most commonly enter the body through a skin wound. Clostridium tetani bacteria produce a protein called tetanospasmin or tetanus toxin, which attacks nerve cells, causing spasms. The Centers for Disease Control and Prevention reports that about 50 cases of tetanus occur annually in the United States. Recognizing the early symptoms of tetanus enables you to seek prompt medical attention if you suspect you or a loved one might have contracted the illness. The time from initial infection with Clostridium tetani to the first early symptoms of tetanus ranges from three to 21 days. On average, symptoms begin on day seven or eight after infection. Typically, the first symptom of tetanus is spasms in the masseter muscles, which control the jaw. During a spasm, the masseter muscles are rigid and the jaw is fixed in a firmly closed position. This symptom of tetanus is how the illness came to be known as "lockjaw." Facial spasms are another early symptom of tetanus. They typically appear at about the same time as do jaw symptoms. The facial muscle spasms cause unnatural expressions. 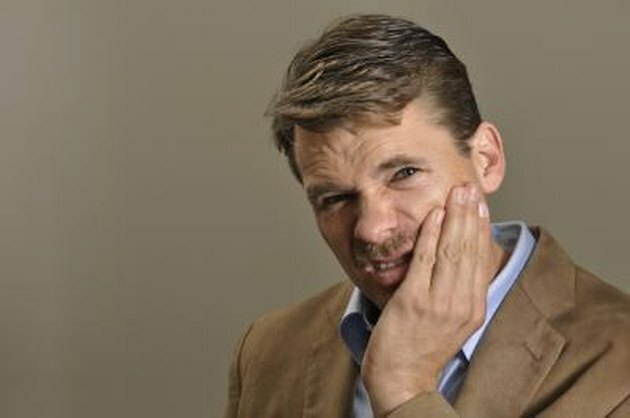 Spasms around the mouth can cause a rigid, odd grin called risus sardonicus. The early symptoms of tetanus appear sequentially as the effects of the tetanus toxin move downward through the body musculature. Neck stiffness typically follows jaw and facial spasms. Swallowing difficulties commonly appear shortly after neck stiffness. Swallowing requires the coordinated actions of several muscles. Spasms in the swallowing musculature disrupt the coordinated effort necessary for swallowing. Abdominal muscle spasms and rigidity indicate further progression of tetanus. The spasms cause the abdominal wall to feel hard to the touch. The early muscular symptoms of tetanus are often accompanied by sweating and fever. These symptoms persist through the later stages of the illness. Neonatal tetanus is a rare form of the illness in the United States. It occurs when the umbilical stump is infected with Clostridium tetani bacteria. Early symptoms of neonatal tetanus include generalized muscle weakness and poor feeding. Localized tetanus is another uncommon form of the illness. With this variant, spasms occur only in the muscles near the wound. Fever and sweating are usually absent with this form of tetanus.